Humans have used acoustical, optical, mechanical and electrical phenomena to embody art objects and expressions in the form of music, sculptures, paintings, poems and performances. By understanding the physics phenomena, we can gain fresh insights on how to better design, analyse and conserve these objects and expressions. The first case to be discussed in this lecture is the design and analysis of shadow images in Wayang Kulit. The second case is the improvement of the musical playability (and how it affects the conservation) of the bundengan, an endangered musical instrument. Dr Gea will examine how the dynamic movements of both the shadow puppets and the musical instruments strongly determine their artistic quality. These two cases from Indonesia demonstrate how the dynamics of art objects and expressions provide a more complete insight compared to its static counterpart. Dr Gea earned his degrees from Institut Teknologi Bandung (B.Eng in Engineering Physics) and Technische Universiteit Delft (M.Sc. In Applied Physics, Dr. In Applied Physics). After a twoyear postdoc research at Technische Universiteit Delft, he joined the Faculty of Engineering in Universitas Gadjah Mada. In between 2003 and 2013, he applied optical measurement methods to study the dynamics of DNA molecules and microscopic flows inside labonachip devices. 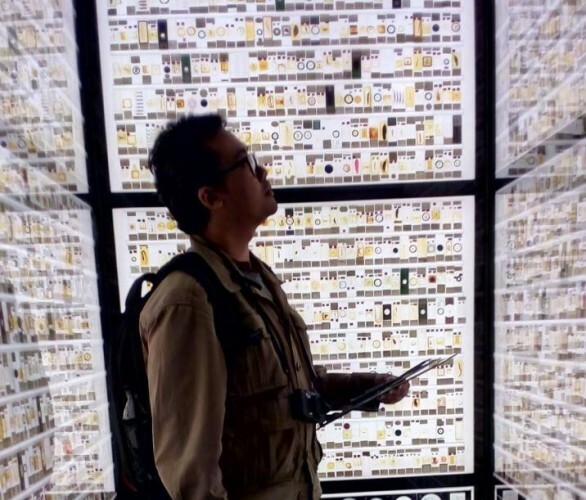 Since 2013, he has been using his engineering skills and scientific curiosity to investigate unconventional topics and pursue unusual questions at the interactions of art and technologies, ranging from the shadow puppet movements in the ancient art of Wayang Kulit.